A puppy’s first year is filled with findings, wiggles and laughter. Puppies squirm in all the odd places, sniff all the strange objects, lick everything they can and find something to splash into even when we don’t want them to! This book of poems explores the first year of a puppy’s life, going through an adventure after the other, one month at a time. Puppy’s first days, puppy’s first weeks in a new home, puppy’s encounters with snow and the school bag, puppy’s duty to protect… What happens when puppy is full of good intentions, yet his actions go wrong? Read the rhymes and laugh with your little one. From the author of “Joyful Trouble”, No.1 Bestseller Children’s Historical Fiction, No.1 Most Gifted Young Adult and Top reviewed Kindle Storyteller book. This is such a delightful little book that made me smile and giggle at all the antics in Puppy’s first year of life. There is such a lot to learn and such a lot to get in trouble about. 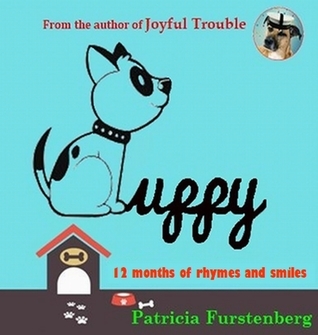 There are twelve poems with each one representing a month of Puppy’s life, everything is seen through Puppy’s eyes and how Puppy understands situations. There are a lot of adventures as Puppy really wants to be part of the family and please everyone but there is also a confidence about Puppy that increases as Puppy discovers a little bit more about the world every month. Love the little pictures throughout the book which make Puppy look full of mischief, happy and loved by everyone. Everything is a first, the first holiday, the first day at school for ‘Pup’ (the daughter of mom and dad) the first Christmas and of course Puppy’s first birthday. There are many more events all perfect for little ones to interact with an adult and ask questions. The poems are full of adjectives that conjure up instant pictures of the scenes that Puppy are seeing and feeling. Puppy is one very curious little dog that is very much part of this lovely family, including a visit from Granny and Grandad. There are not only adventures but also misadventures, I just loved the first day of school poem. This is a little book that will be returned to so many times to read and re-read. Just lovely! The Judges were Mathew Prichard, Agatha Christie’s grandchild involved in publishing and promoting her books since 1960s, David Brawn, Agatha Christie’s Publisher at Harper Collins UK for the last 20 years and Daniel Mallory who works primarily with thrillers and crime fiction at Harper Collins US. Thank you so much, Sue, for a lovely book review. I am so happy you enjoyed Puppy! I truly appreciate your continuous support.